I like to bake cookies. Most of the time, they're drop cookies, like chocolate chips. Sometimes, though, I like making roll-out cookies and decorating them. I'm particularly fond of cookie cutters that emboss designs into the cookies, because that means I can color in the lines rather than freehanding the drawing. 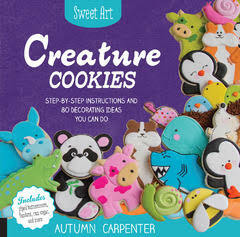 I decided to review Creature Cookies because I know I can use some help with my cookie decorating technique. The cookies on the cover are adorable, but that's just the beginning. Browsing through the book showed me just how far I need to go. Yikes. the designs of some of these cookies are freaking amazing. Some look like fairly simple designs, but they have personality. Others are a little more complicated. Most of them are above my current abilities. Which is great. I wouldn't want a book that showed me exactly what I already know what to do. Most of the cookies are flat, but some are layered, like the dinosaurs and polar bears where the heads are a separate piece, or the bumble bees and ladybugs, where the wings are separate pieces. And then there are the 3D jumping dolphins, where the dolphins are leaping out of a round cookie that's got frosting "water." Besides decorating instructions, there are recipes for cookies and icing, as well as information about tools, tips, and techniques. 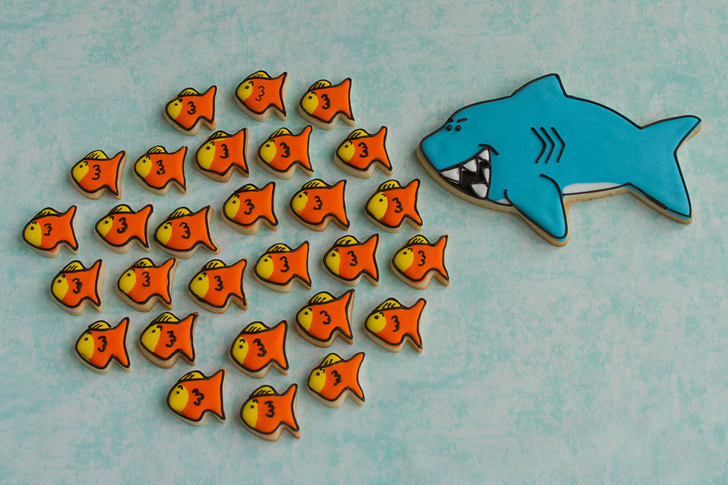 I haven't decorated any cookies based on this book yet, but I have a few favorites picked, including the fish and sharks. These look fairly simple to do but they're still cute. And they'd look so great on a plate, with the sharks chasing the fish. Or the fish chasing the sharks.